1. Melt the butter in a thick-bottomed pan. Add the flour and stir in. Cook for few minutes over a low heat. 2. Gradually add the warmed milk and stir until smooth. 3. Allow to simmer for a few minutes whilst whisking or stirring. Season to taste. Follow the package instructions to cook the macaroni al dente. Strain the macaroni well in a colander and add to the pan containing the butter. 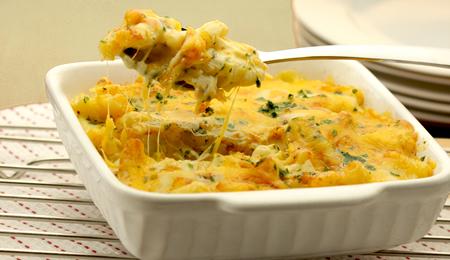 Combine the mustard, white sauce, seasoning and half the cheese with the macaroni. Place in a earthenware dish and sprinkle with the remainder of the cheese. Brown lightly under the grill and serve. Serve hot with a sprinkle of cayenne pepper and chopped Italian parsley. This entry was posted on May 15, 2010 at 5:02 am and is filed under Uncategorized with tags Macaroni Cheese, soul food. You can follow any responses to this entry through the RSS 2.0 feed. You can leave a response, or trackback from your own site.